It came for the Tea Party, and now its coming for Latinos. 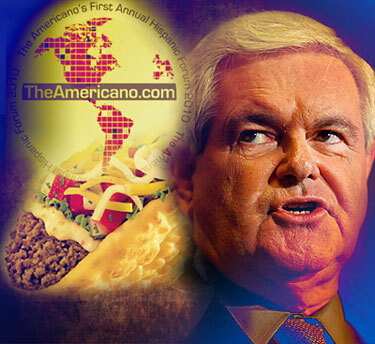 Newt’s Americano stays about as true to “Hispanic Heritage” as Taco Bell. This is all part of an ongoing campaign—financed by powerful money interests—to co-opt every grassroots political movement in America. The war-profiteering plutocratic elites want to be assured that—in the face of growing opposition from Americans on both the “left” and the “right”—budgetbusting internationalist policies promoting U.S. military adventurism in the Middle East and across the globe—in the name of what is now being touted as American “national greatness”—will be preserved. That New World Order that he’s talking about is the same New World Order that successfully infiltrated the Tea Party, and routed their bi-partisan anger over the entire Washington establishment into a right vs. left campaign platform for the Republican Party. Now they are setting their sights on other disgruntled Americans, using the Tea Party co-opt as a model for future takeovers. We all know now how this works. The Republicans send in their operatives who pose as Washington outsiders. They gain the trust of their target group by espousing rhetoric opposed to government largess and fiscal mismanagement. While leaning hard on the Democrats, these operatives will also give light criticism to fellow Republicans for cronyism, stagnation and being “out of touch” with the concerns of the average American. They promise to “take on the system” and restore the government to the people, placing the focus on economic and social issues, while being careful to steer away any debate that would challenge the power of the military-industrial-complex. That’s the game. Now this same game is being played against Latinos, with an emphasis being placed on immigration reform. That sounds nice. But, if you browse the site, you find that the only thing they are “celebrating” is the Republican agenda. “The richness of the Hispanic Heritage” is nothing more than ambiance, used like music or props in a feature film. In truth, The Americano stays about as true to “Hispanic Heritage” as Taco Bell. Yeah, we saw how that turned out. The only thing that Newt’s “Contract with America” accomplished was to secure a decisive victory for the Republicans in the 1994 elections. On December 2nd, The Americano sponsored a two-day conference in Washington D.C. featuring a number of sell-outs from the Hispanic community. Gingrich, who once referred to Spanish as “the language of living in the ghetto,”headlined the event, and pitched his centrist version of comprehensive immigration reform. That “zone,” accrording to Ginrich, seperates those immigrants who came here as children versus those who crossed the border as adults. Part of Gingrich’s proposal would include establishing an ID card that would track a worker’s legal status. This is quite an about face for Gingrich. Following the attacks on 9/11, Gingrich came out firmly against the establishment of a National ID card. During congressional hearings debating the issue, Gingrich said that he, “would not institute a national ID card because you do get into civil liberties issues.” Apparently things have changed. Jeb Bush, the former Governor of Florida—whom the Guardian recently described as a “party centrist” and “GOP emissary to America’s Latino communities.”—intends to follow up the Gingrich event with the Hispanic Leadership Network Inaugural Conference that will be held in Coral Gables, Florida on January 13th. Jeb will host the event through the American Action Forum (AAF), a shadow GOP front group created by Karl Rove and Ed Gillespie. This organization is one of four groups, serving as a collective think tank and propaganda machine, to rebuild the Republican brand. Jeb serves as a board member of AAF, along with former DHS Chief, Tom Ridge. Doug Holtz-Eakin, the former economic advisor to John McCain’s presidential campaign, is the apparent front man. Notice all of the ‘centrist’ jargon like “center-right policies,” “center-right voters” and “grassroots action.” Tea, anyone? There is nothing grassroots about AAF. It’s the same group of establishment Republicans who were the architects behind the George W. Bush presidency. Yep, Newt Gingrich and Jeb Bush are working hard to get that Latino vote. But that shouldn’t surprise anyone. Hispanics comprise the fastest growing demographic in the nation. By 2050, Latinos are projected to make up 25 percent of the U.S. population. But there is something far more insidious behind the GOP’s latest outreach to the Latino community. It’s not just the votes that they want. The GOP sincerely wants comprehensive immigration reform. In fact, they want to legalize as many immigrants as possible. Why? Because there are new wars looming on the horizon, and more immigrants mean more soldiers. Right now, military personnel are already spread too thin with conflicts in Afghanistan, Pakistan and Iraq. New wars will require hundreds of thousands of fresh recruits. Upon passage of the DREAM ACT, Newt Gingrich praised certain “useful” aspects of the bill, particularly that which would allow the children of immigrants, who were brought here by their parents, to become American citizens if they join the military or go to college for two years. I hope Latinos remember who Newt Gingrich and Jeb Bush are. They are warmongers, first and foremost. Last summer, Newt Gingrich gave a speech to the American Enterprise Institute and said that the U.S. did not take George W. Bush’s 2002 “Axis of Evil” speech seriously. He said that we should have followed up the invasion of Iraq with military strikes on Iran and North Korea. And Jeb Bush is an original signatory to the Project for the new American Century (PNAC), which sets out a plan to establish a global American empire by way of military preeminence. So don’t think for one minute that these guys want immigration reform for any other reason than to enlist the children of these immigrants into the armed services. Expect this campaign against Latinos to accelerate, and reach new levels, as the days progress. The Republicans are energized, and encouraged, by the recent election of Cuban-American—and I might add: Tea Party favorite—Mark Rubio. In fact, many are predicting a Gingrich/Rubio ticket for 2012. Some even say that they are a lock. “Think about it. If anyone other than the former Alaska Gov. Sarah Palin gets the Republican nod for the top spot, it’s a no-brainer to pick Senator-elect Mark Rubio of Florida Senator as the VP on the ticket. And if you want to look a little further into the future of this Latino co-opt by the GOP, you might want to follow the career of Jeb’s young son, George Prescott Bush (How’s THAT for a name). Yeah, folks, just when you thought we’d seen the last of the George Bush nightmare. Looks like we might have a trilogy. He’s been given the nickname “47,” as in the 47th presidency, which would place him up for election some twelve years or more into the future. What a frightening thought. But let’s not get ahead of ourselves. Right now, Latinos have an opportunity to nip this thing in the bud before it has a chance to lock its icy grip around their throats. Just remember–When it comes to immigration reform, Latinos and the GOP want the same thing—but not for the same reasons. For Latinos, the path to citizenship may very well be a ticket to a better life in America. But if the GOP has their way, that citizenship may very well be a ticket out of America—and off to some foreign hell hole—where Latinos and their children just might end up dead.